Nexus 5 vs. Nexus 4: Should You Upgrade? Google has revamped its Nexus handset, but do the changes warrant a replacement? As expected, this year Google continued its Nexus smartphone legacy. The previously rumored Nexus 5 became a reality not long ago, and fans of the brand can now purchase the device from the Google Play Store at a very competitive price. However, the big question is: should you buy the Nexus 5? More specifically, if you already happen to own the Nexus 4, is the upgrade worth it? Well, this upgrade-related question has been passed around ever since the Nexus 5’s unveiling, and today we’re going to try and give you an answer. Let’s put these two Nexuses side by side and see what’s what. One of the most visible upgrades brought by the Nexus 5 is the new display. The handset in question features a 4.95-inch IPS Plus display boasting a resolution of 1080 x 1920 and a pixel density of 445 pixels per inch (PPI). In contrast, the older model features a 4.7-inch panel with a resolution of 768 x 1280, resulting in a pixel density of 318 PPI. Also, while the Nexus 4′s screen is protected by Corning Gorilla Glass 2, the Nexus 5 benefits from the latest Gorilla Glass 3 panel. While the difference between 318 and 445 PPI might not sound like much, the difference in image quality is visible when these two smartphones are being looked at, side by side. We also noticed that the Nexus 5 offers better touch responsiveness and better visibility in bright sunlight. 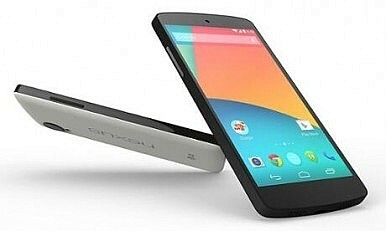 The Nexus 4 can still hold its weight with the included Snapdragon S4 Pro quad-core processor clocked at 1.5 GHz, the Adreno 320 graphics chip and 2 GB of RAM. However, the Nexus 5 is a noteworthy step-up, as it delivers hardware that is up to par with any flagship released in the second half of 2013. The handset offers a Snapdragon 800 quad-core 2.3 GHz processor, an Adreno 330 GPU and 2 GB of RAM. Benchmark scores are going to reveal that the Nexus 5 is much more powerful than its predecessor, but in reality, the Nexus 4 can still handle any task you might throw at it. While the Nexus 5 performs better, it’s most likely that you won’t notice big differences while browsing the web, watching movies and/or performing any other day-to-day tasks. However, the difference is more noticeable when it comes to more demanding applications and games. This gap in performance will also become more visible as time goes by and more demanding apps will be launched on the Android ecosystem. While the Nexus 4 packed an 8 MP camera just like many other flagship phones of its generation, the number of pixels is not everything. Color reproduction was not the greatest, shooting in low-light condition was disappointing, and there were other top-tier smartphones that did a way better job at the time of the Nexus 4′s release. The good news is that Google and LG learned from their mistakes and the Nexus 5 delivers a pretty solid shooter. While we’re still looking at an 8 MP camera, everything else has been significantly improved, from the sensor size, to the addition of Optical Image Stabilization. As some of you might already know, OIS is a pretty big deal nowadays and it’s slowly but surely becoming the norm for flagship smartphones. To put things in perspective, neither the Samsung Galaxy S4 nor the Galaxy Note 3 take advantage of OIS. As such, the Nexus 5 offers a pretty advanced shooter, and it’s a definite step-up from what the Nexus 4 has to offer. One of the biggest let-downs in regards to the Nexus 4 was the fact that it lacked LTE support. Fortunately, this has been fixed with the Nexus 5, as the device in question does offer LTE connectivity out of the box. Last but not least, we should also talk about the software-side of things. As expected, the new Google flagship smartphone introduces a new Android OS as well: version 4.4 aka KitKat. Nevertheless, since the Nexus 4 is on the list of devices that will soon be updated to Android 4.4, software shouldn’t play a big part in deciding whether or not it’s worth the upgrade. One thing to keep in mind, however, is the fact that some KitKat software features might remain exclusive to the Nexus 5, at least for a good while. These features include the home screen integration of Google Now, as well as the ability to start “Google search” by speaking the keywords “OK Google”. While the latest model offers more than its predecessor in nearly every aspect, upgrading from the Nexus 4 to the 5th iteration remains a matter of personal preference. The reason for this is simply because the Nexus 4 can still carry its weight, and software-wise things will be on equal ground soon. However, if you’re able to take advantage of LTE network speeds in your area, if you want a better camera and if you’re in need of more processing power for demanding games, then the Nexus 5 is worth it. More so, the Nexus 5′s low price of $350 (off-contract) will definitely make it easier for some of you to decide. As usual, feel free to share your thoughts by leaving a comment below. Would you be willing to upgrade from the Nexus 4 to the latest model? Google fans have high hopes for the upcoming I/O event.